When I spotted a picture of Victoria Beckham in her Junya Watanabe caped trench last week I was immediately smitten. Although the clothing in question is admitedly slightly strange looking, it is also oddly cute (see earlier post: Ugly Beautiful). 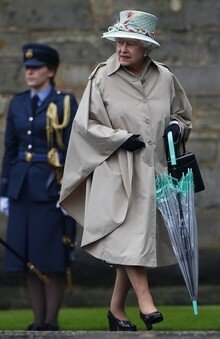 Now today there are pictures of Queen Elizabeth wearing a caped trench during her rain sodden appearance in Scotland. Two endorsements for the trench cape – or the cape trench, whatever your point of view – in a week! Presumably Her Majesty’s is by Burberry who hold a Royal Warrant. No one wears trench coats in Hong Kong which is a pity style wise but presumably down to the humidity. So perhaps Mrs Beckham’s style is the answer – leaving the arms free to let the air circulate. I’m ready to trade in my mini Burberry and give it a try.